Join this 2-hour dark history tour of Madrid's old town and explore the hostile dark time of the Los Madriles. This night tour is guided by an elegant and professional narrator dressed in accurate historical outfit. On this tour, you will learn the darkest aspects of the Spanish Inquisition, throught the streets and squares of the Madrid de los Austrias. At dusk, when the sun sets over Madrid, shadows from the past stretch like ancient ghosts to veil the city in the black of night when the lantern leads our way. During this walk through alleys and squares, you will explore hidden corners and hear facts and ghost stories, superstitions and old beliefs, as well as stories of hatred and persecution. 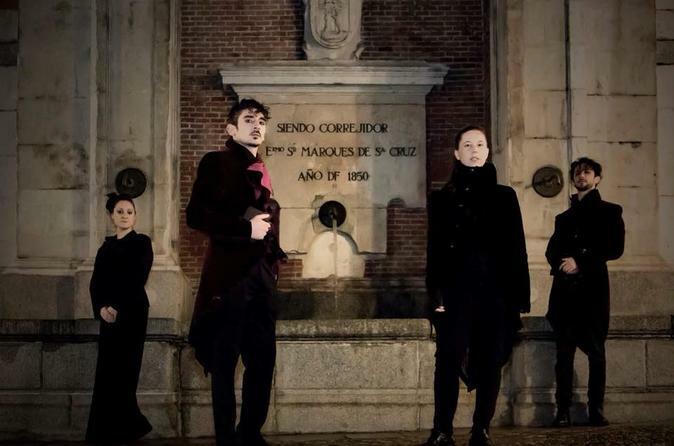 Mysterium Tours in Madrid presents the dark side and the folklore of the Los Madriles, narrated by the voice of an elegant narrator who will share with you the most intimate and atrocious aspects of the Spanish Inquisition that lead to a knock on the door under the cover of darkness. This tour does not include access to interiors of sites visited and no “jump scare” actors. We rely on the professional story telling skills of our guides.